Kathleen Forgette is a self-made master of her little kitchen. 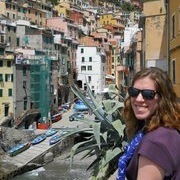 She lives in Washington state with her usually famished husband, Joe and their Labrador retriever. They love to hike, swim, and cook cupcakes together (when Joe can be convinced). Kathleen blogs over at Sage and Sound. Although I’d like to say I fell madly and deeply in love with rhubarb right around the time I fell for friendlier fruits like blueberries and strawberries, I didn’t. 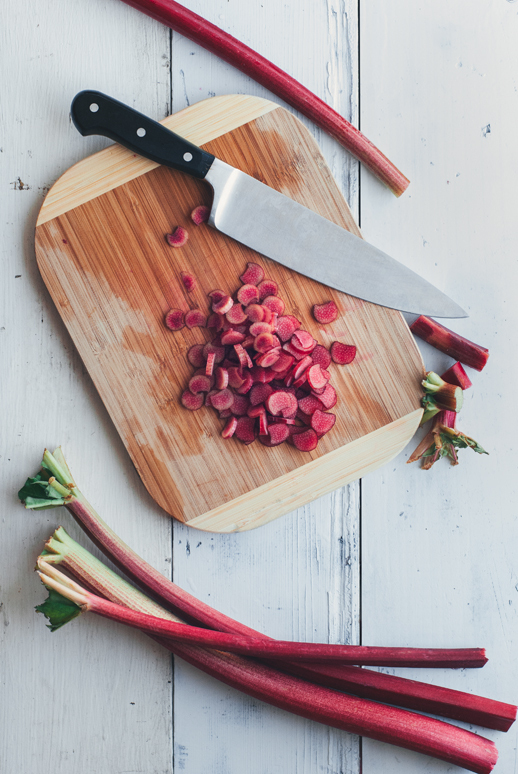 I fell in love with rhubarb about a year ago as my palate matured, when I started enjoying swiss chard and brussel sprouts. But unlike swiss chard and brussel sprouts, this tough, celery-like stalk does not improve with a little fresh garlic and olive oil. You have to play with rhubarb, coax it into submission, and draw out its sweet subtleties. This process finally came to fruition after about a year of dabbling in rhubarb muffins and upside down cakes. Although delicious, the flavors didn’t meld well. It was either undercooked, syrupy sweet, or just plain acerbic. Finding myself alone in the kitchen on a gray Saturday afternoon, I desperately diced, sprinkled, stirred, and taste tested, hoping for something warm, charming, and edible. Something I could store in mason jars, and for the next five Christmases, hand them out to family and friends amid “oohs,” “aaaahs,” and “just what I hoped fors.” And after about 25 minutes of stirring, adding, and breaking down, it happened. At first, I burned my tongue and had a moment, but there it was: the perfect mix of soft fruit and warm syrup sitting on my little stovetop. I felt victorious, elated, and hungry. After years of enjoying others’ rhubarb pies, I had finally discovered the potential of this funny looking vegetable—and yes, it is a vegetable. I drizzled it over a slice of olive oil lemon cake, added some yogurt, was content, and promptly fell asleep on the couch. I’m certain that I’ll never be able to recreate that flawlessness again. I have the memory of that day I was the executive chef for myself, a world explorer in my modest kitchen. I’d like to think that I learned a lesson: sticking with something that is bitter and coarse long enough, enveloping it with sweetness and warmth, and just waiting might draw out the comfort you’ve been looking for all along. fresh lemon juice — 2 tbsp. Remove the stems from the strawberries. 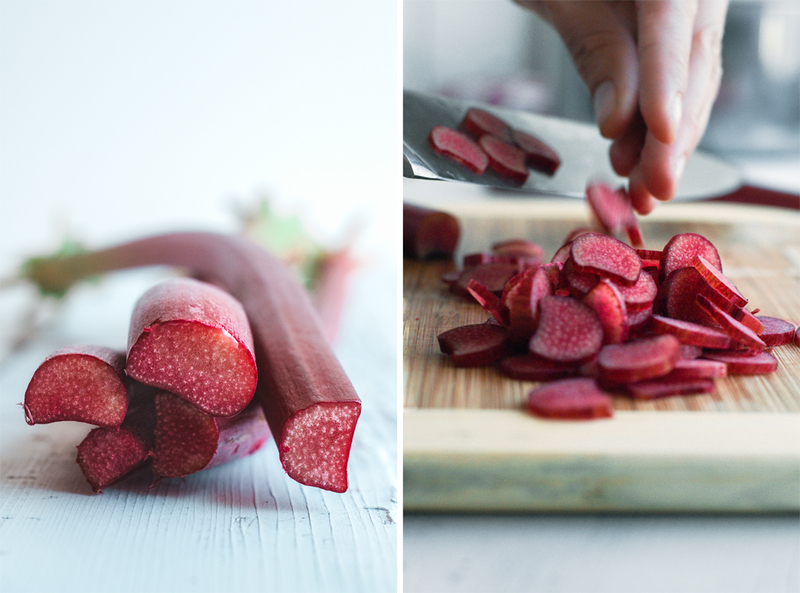 Then, slice the rhubarb into small, thin pieces. Combine the ingredients in a small pot on medium high heat. Allow the mixture to boil for about 5 minutes, and then bring it down to a simmer. Reduce the compote for another 20-30 minutes, stirring occasionally so it doesn’t stick. The compote’s done when the strawberries are completely soft and broken down, and the rhubarb is mostly broken down and slightly transparent. There should be plenty of red juice; the chunks of fruit give it a delicious texture. Drizzle the compote over your favorite dessert or let it cool and use a bit of it in a cocktail.